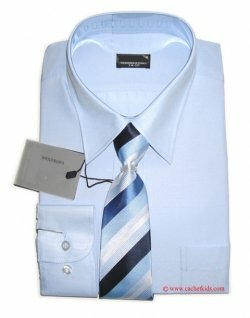 Sky blue with matching tie. 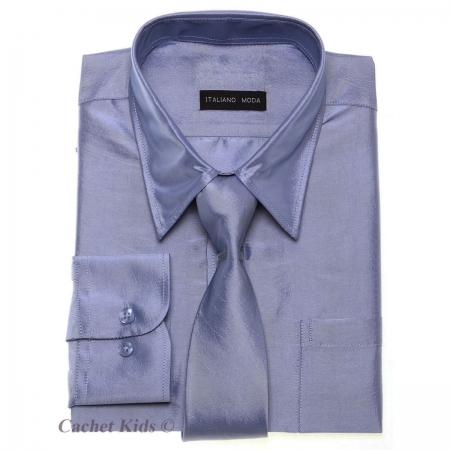 This boys shirt has a unique deep sheen shiny fabric that will make your boy stand out in any party. Long sleeved with one pocket. Top quality satin polyester silky shiny fabric that will last wash after wash. This shirt is one of our best quality shirts and is available in our retail shop on the high street in Ashford Middlesex where you can come to see/try the product and buy. Please beware of cheap imitations from Internet only traders. This style of shirts has big cut. We have resized them in accordance with the standard UK size shown in brackets. Please see this boys shirt measurement guide for the actual measurements.